The 2012 Millard Fuller Legacy Build will be a little different with both a U.S. hub in Henry County, Ga. (Sept. 9-14), and an international hub in La Florida, Peru (Sept 1-8). But just the same as the previous three Legacy Builds, the goal remains to dedicate at least 100 homes through Fuller Center partners across the United States and around the world. Among Fuller Center partners who have planned dedications for the Legacy Build is the highly productive Fuller Center for Housing-Armenia, which has built or renovated 200 homes since 2008. Two homes will be dedicated as part of the Legacy Build, one for a family of six and one for a family of seven. Kanakar and Martik Gevorgyan bought their house in 1980 and raised their two children, Artak and Armine, in the house. Martik, though, was proclaimed missing in action in 1992 after war broke out between Nagorno Karabagh and Azerbaijan. The family still does not know whether he is alive or dead but holds out hope that the family patriarch will return someday. Their children live in the home, as does Artak’s wife Hripsime and their two children, Meri, 13, and Martik, 12, named after the grandfather he has never known. The family earns its main income from farming and have many daily needs covered. But after Martik disappeared at war, the house began falling into disrepair. Now, with the help of Fuller Center Armenia and the International Committee of the Red Cross, the house will be renovated. The partnership between Fuller Center Armenia and the ICRC began in 2010 and has helped 18 families obtain decent housing. 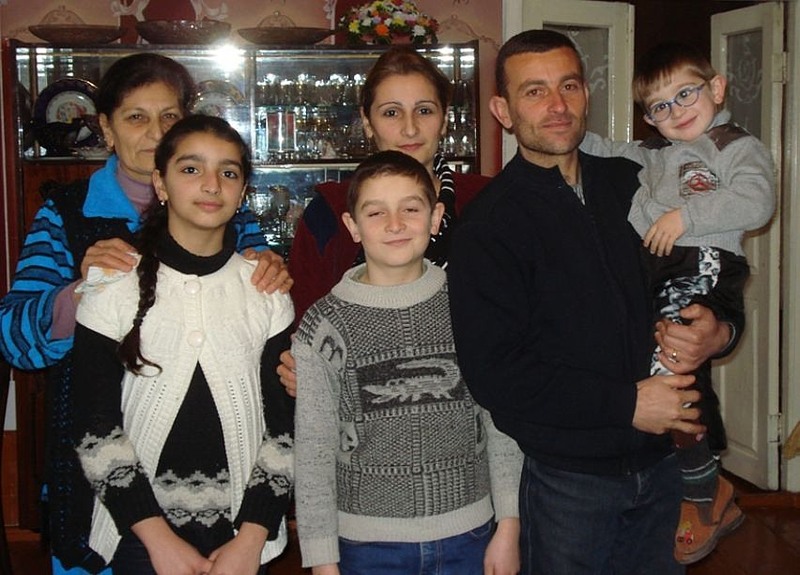 Tigran and Salvi have four children – Samvel, 11; Hasmik, 10; and twins Sargis and Sasun, 3. The family lives crammed together in a small house in the Irind village of the Aragatsotn region. 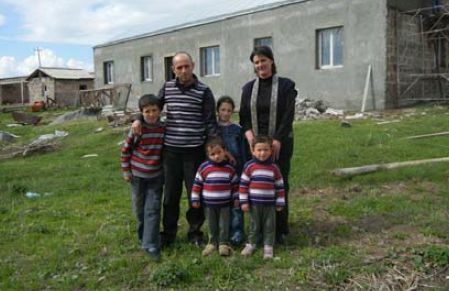 After living for years with Tigran’s parents, the family was fortunate enough to receive a half-built house from the village municipality but they have been unable to finish construction after running into financial problems. The Haroutyunyans’ main income comes from animal husbandry and farming. They grow potatoes, cabbage and green beans, but it is not always enough to support the family and build a house. But with The Fuller Center’s help, they soon will have a home big enough for their school-aged son and daughter to have their own rooms. Click here to contribute to The Fuller Center for Housing’s work in Armenia.